In my long quest for a mate, I found that only independent women are interesting. Those who were wards of others — either incapable of independent judgement, or of feeding, sheltering or defending themselves — were not only uninteresting but a source of danger. A person who is either beholden to a third party or has no choice but to parasite off you isn’t a very good romantic partner. A symbiont is a little better but the relationship then blends romance and survival too closely for comfort. Dryden: Are you really going to give them artillery, sir? Brighton: I was wondering that, sir. Might be deuce difficult to get it back again. Allenby: Then I can’t give them artillery, can I? Only with the American politicians it’s not a matter of giving artillery or anything else, but that of merely not hindering the acquisition of defensive small arms by lawful people. Many of them won’t do even that little because it directly interferes with their personal interests. Independent people have little need for intrusive governments, while weak and dependent populace does. “You don’t need a weapon, I will protect you” is the creed of both individual and institutional domestic abusers. That’s a good warning sign and a conclusive litmus test for bad intentions. On Valentine’s Day, it’s also a good benchmark for your chosen one — would you trust your mate’s judgement and intentions enough to arm him or her? If not, run now. Firearms are the most obvious defensive weapons but almost anything can be used offensively and probably would be in the long run. If your mate, in turn, doesn’t trust you — deeming you either reckless or evil — ask yourself if that apprehension is reasonable. If not, you can try to dispel the misconception or find somebody more appreciative. If the concern is reasonable, consider what you can do to improve. This entry was posted in civil rights, interesting people, rkba, self-defense, shotgun, weapon and tagged 12ga, CZ, pump shotgun, woman. Bookmark the permalink. 6 Responses to Independent women. “…she wants to help you by imposing some infantile group health care program on you at the point of the kind of gun she doesn’t want you to have”. Wow. That’s a mouthful, but it sure captures a lot in a tightly wrapped package. Or as Neil Smith puts it, why on earth would you vote for someone who doesn’t trust you with weapons? Between the latest from Sen. Feinstein and the proposals in the California state legislature, I’ve reached the conclusion that any gun owner who votes Democrat has to have his head examined. That’s not to say that voting for the other guy is foolproof, but at least you have a chance of getting it right. As I mentioned before, the answer is zero tolerance voting: vote against gun rights, and you lose my vote, nothing else you ever did will ever count again. Oleg, than you for your thoughts. Back before marriage I was taught, “Look for complimentary differences and essential similarities. Also look for a generous heart.” That has served me well. We had to learn emotional independence as we grew. That is a lesson you don’t learn once, but must re-learn from time to time. 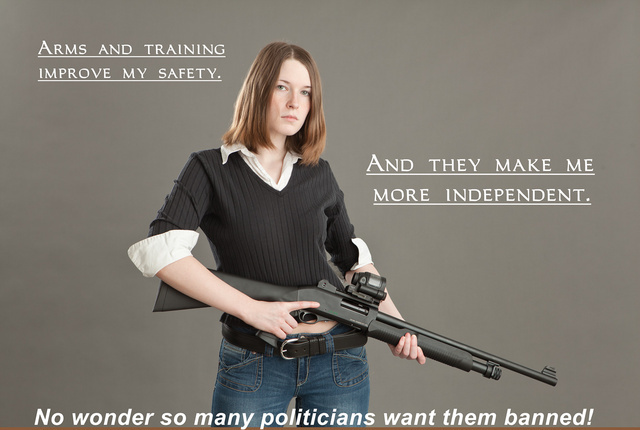 This photo captures the essence of what gun banners hate. It isn’t that they are afraid of guns as such — often they own guns themselves and even admit it as part of the pretense that they don’t really want to disarm us. It actually is that they fear and loathe the idea that someone, anyone, in this country might actually be independent — might not need them — might live a life that doesn’t depend on them. If you’re independent, they can’t control you, and that is what they fear and hate and aim to destroy.